Our Easter Bunny’s On TV! Our Easter Bunny was more than happy to help out our friends at Simply Good Video to put together a video promo for the Easter Brunch at Marco’s at The Pennsauken Country Club! No Easter Bunnies were harmed during filming. This spot will run on Pennsauken Television as well as Facebook, Twitter and more! And if you need a visit from the Easter Bunny for an upcoming event, let us know! E-mail us for more information and pricing. Just Plain Silly Twisting At 2015 Irish Nite! We’re super excited to once again be a part of Mary Queen of All Saints Parish’s annual Irish Nite! 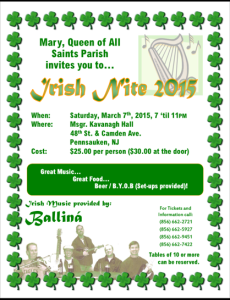 This event features wonderful food, great Irish music and more! Tickets are $25 per person and $30 at the door. For more information, click here.